In general, patients presenting with a patellar tendinopathy have recently experienced a change in their training regimen. For this reason it is important that care be taken when changing a training regimen. Rutland et al. recommends that changes should be less than a 10% per week increase in physical load, repetitions, intensity, frequency, and duration of activities. "Fatigue, poor technique, and training errors may play a role in this disorder. "4 Because of this, it is important to educate the patient on proper technique and the elimination of training errors. It is also important to educate them on the importance of adequate rest when they have become fatigued to avoid placing stress on the patellar tendon. Education on a home exercise program designed specifically to meet impairments discovered during examination and treatment will also be beneficial. 1. Khan KM, Maffulli N, Coleman BD, Cook JL, Taunton JE. Patellar tendinopathy: some aspects of basic science and clinical management. Br J Sports Med. 1998;32(4):346-355. 2. Jensen K, Di Fabio RP. 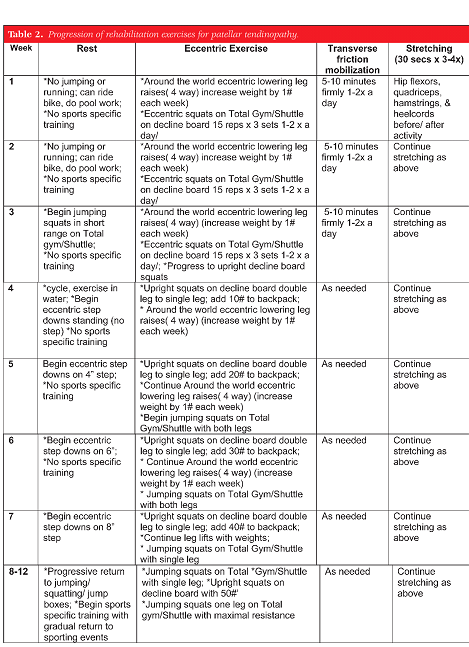 Evaluation of eccentric exercise in treatment of patellar tendinitis. Phys Ther. 1989;69(3):211-216. 3. Wilson JJ, Best TM. 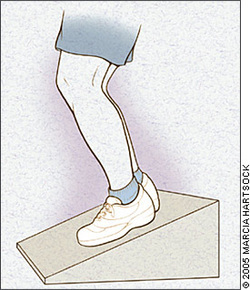 Common overuse tendon problems: A review and recommendations for treatment. Am Fam Physician. 2005;72(5):811-818. 4. Cook JL, Khan KM. What is the most appropriate treatment for patellar tendinopathy? Br J Sports Med. 2001;35(5):291-294. 6. Rutland M, O'Connell D, Brismee JM, Sizer P, Apte G, O'Connell J. Tre. N Am J Sports Phys Ther. 2010;5(3):166-178.